How Hannukah Got Americanized Contrary to what some Americans believe, Hanukkah traditionally isn't one of the most important holidays in the Jewish calendar. 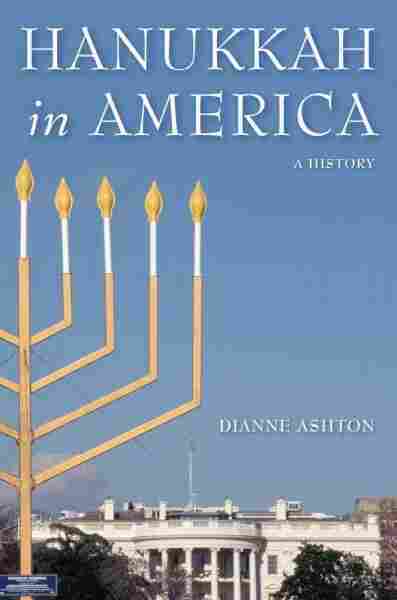 Host Michel Martin speaks with Dianne Ashton, author of the book Hanukkah in America, about how and why the holiday has gained more importance in this country over the decades. Contrary to what some Americans believe, Hanukkah traditionally isn't one of the most important holidays in the Jewish calendar. Host Michel Martin speaks with Dianne Ashton, author of the book Hanukkah in America, about how and why the holiday has gained more importance in this country over the decades. This is TELL ME MORE from NPR News. I'm Michel Martin. Tonight, as you may know, is the first night of Hanukkah, the Jewish festival of lights. And tomorrow is Thanksgiving. So later in the program, we'll have some ideas on how to fuse those holiday menus so you're not completely burned out on cooking when it's all over. But first, we wanted to take a fresh look at the history of the festival of lights, particularly how it's celebrated in the U.S. So we've called Diane Ashton. She's a professor of religion at Rowan University, and she's author of the book "Hanukkah in America: A History." Professor Ashton, welcome. Thanks so much for joining us. DIANE ASHTON: Delighted to be here. ASHTON: Thank you so much. MARTIN: So, you know, for those who aren't familiar, just if you could just briefly explain the Hanukkah story. ASHTON: Hanukkah commemorates the rededication of the Temple in Jerusalem in 164 BCE, when Judah Maccabee and his followers, who fought with him against Antiochus IV. He was the king of Assyria. And Assyria governed Judea in those days. And Antiochus decided to try to destroy Judaism, and he did that primarily by focusing on taking over the Temple. He took out anything of value. He stole the charity money for widows and orphans. He took out the menorahs, and he installed a huge statue to Zeus in the middle of the temple in Jerusalem. And so Jews were outraged. And when the temple was being rededicated, they had to re-light the menorah, which symbolized the presence of God. And they found only a small flask of oil, which was a pure oil prepared by the priests. But, miraculously, it lasted eight days. And so Hanukkah is celebrated for eight days, and on each evening, we light an additional light. MARTIN: OK, so there is, I think, a sense by some that Hanukkah is a very big deal in the Jewish faith. And one of the things that your book makes clear is that that's not true. ASHTON: That is not true. Judaism categorizes Hanukkah as a minor festival. It is certainly not as important as the Sabbath or Rosh Hashanah or Yom Kippur or Passover. It's minor. MARTIN: So how did it get to be such a big deal? Or is it, in fact, such a big deal? ASHTON: Oh, yeah. It's a big deal in the United States, there's no question about it. Holidays are big business in the U.S. And so Hanukkah is a holiday that has been able to be brought into the marketplace of the holiday season through cards and decorations and gifts and foods. And 'cause it's a celebration that occurs in people's homes, it's a very joyous holiday. It's kind of ripe for that kind of development. MARTIN: Now I think there's a feeling by some - and you talk about this a lot in the book - that Hanukkah serves as kind of the Jewish answer to Christmas, right. So that Jewish kids don't feel left out of the cultural hazarai - if I can use that word - around Christmas. MARTIN: Do you think that there's some truth to that? MARTIN: In the book, you also talk about how Jews during different eras in American history interpreted the Hanukkah story differently. Could you give us just a little bit of an example of that? ASHTON: Well, I think what surprised me the most was the first example of that in the mid-19th century - not even the late 19th century - rabbis and religious leaders were having a huge debate over who should lead Judaism. There was a lot of fracturing. There were people who were going in all kinds of different directions. There was no rabbinical school in the U.S. There were very few rabbis. And so the question of who was going to be the leader and what direction would be good for Judaism to go in the U.S. was a very hot topic. And people involved in that debate used the Maccabees - the image of the Maccabees as these great leaders. And each side in the debate claimed to be Maccabees for the modern era. And so their debates in the Jewish newspapers was the really - the first thing that kind of impressed American Jews with the importance of the Hanukkah story and that Hanukkah really had an important meaning. And I think that was really the spark that lit the Hanukkah fire that grew to be the big holiday that it is now. MARTIN: Recently, it's become - the whole question of the commercialism around Christmas has become an important topic among American Christians, obviously, as the abundance of this country becomes available to some and it's less available to others. You know, the whole question of the commercialism is something that I think - I know that, you know, Christian religious leaders really talk about a lot. Are there current debates among American Jews, particularly the Jewish kind of leaders, about Hanukkah? ASHTON: Oh, yes. I mean, just as you say, as Christmas has become so commercialized that people are really wondering if this is a good thing or not and some saying definitely not, Hanukkah has been blown into a really significant holiday. And Jews know that Hanukkah, relative to other Jewish holidays, is not so important, and that some people feel that its commercialism has really been something that's been distorting it. Yes, we need to celebrate Hanukkah, but we don't need to make it into a big commercial event. And a lot of people are concerned that it's really distorting the meaning of it. MARTIN: One of the things that your book makes clear is that there's always been this struggle, as with any minority, of how much to accommodate the culture that they live in, and how much to resist, right. How much to claim their own special space and their own identity and how much to be in the world or apart from the world. I mean, Hanukkah, in a way, is the perfect reflection of that struggle. How do you - do you mind if I ask you personally how you feel about how that struggle has played out at the present time? I mean, because I think, for a lot of non-Jews, Hanukkah is the most visible Jewish holiday. It's the one I bet I would - I'm guessing that non-Jews are probably the most aware of. Do you mind if I ask how do you feel about that? ASHTON: I think that's exactly why Hanukkah is important because it's a boundary holiday. It has grown because it occurs at a time when the rest of the American culture is so visibly Christian. And it's when Jews are most aware of being a very small minority in this society. And so its very existence at that time meant that Hanukkah was going to go one way or the other - either it was going to be completely forgotten, or was going to become very important as a way for Jews to - to work out that being on the boundary. A way to be Jewish at a time when other Americans are definitely not. It's no way to be secular in the Christmas season. It's difficult. It's even more difficult than being Jewish. And so I think that that's why Hanukkah became so important. And I think that's why Jews still struggle with - are we doing the right thing by making such a big deal out of it, even though we want to make a big deal out of it because we want to have it as a way to express that we're Jewish? ASHTON: Potato latkes, of course. I'm just like everybody else. The only distinction is are you an applesauce person or a sour cream person? And that means do you put applesauce on your latkes or sour cream on your latkes? And I put applesauce on my latkes. MARTIN: OK, duly noted. Is there a constituency for both? I'm kind of in the both school - both and school. ASHTON: I - yes. I always have a Hanukkah party at my house and I have always seen people put applesauce on one half their latke and sour cream on the other half their latke. MARTIN: Thanks. See, there we go. Can't we all get along? Right. MARTIN: That was Diane Ashton. She's a professor of religion at Rowan University and author of the book "Hanukkah in America." She was kind enough to join us from Philadelphia. Happy Thanksgiving. Happy Hanukkah. Happy Thanksgivukkah, to you Professor Ashton. ASHTON: Thanks so much, Michel.